If you are looking to own a relaxed, highly affectionate cat, then the Ragdoll is the breed for you! This quiet, gentle and easy-going cat originated in the United States of America and, as their name suggests, is an extremely laid back animal that just loves to flop in your arms like a rag doll. 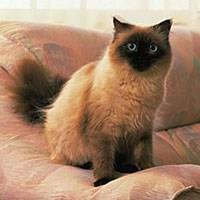 There are many theories as to where this breed originated from, but it is generally thought that its roots are linked in with the Colourpoint Persians, Birmans and the Siamese cats. But no matter where this cat hails from, it is a placid cat that simply loves to be with people. It is a long, muscular broad-chested cat with solid-boned legs, a big skull with rounded cheeks and big blue oval eyes behind a very sweet face. Its beautiful medium length coat is non-matting and it has a soft texture similar to rabbit fur. It has a thick, bushy tail, a ruff around its neck and longer hair (britches) on the hindquarters. The Ragdoll simply loves company and has even been known to follow their owners around like a puppy. They will also want to be involved in the daily running of the house and will be very put out if they are not greeted when you arrive home each day. Should you decide that this cat is ideal for you, be prepared to brush its coat often and provide a dwelling that has plenty of room for playing, exploring and roaming about at will.